At Eero Aarnio Originals everything is about Eero Aarnio. His designs, which are timeless and at the same time modern, appear almost like being from another galaxy, and have found a home at Eero Aarnio Originals. Eero Aarnio Originals is the manufacturer of the iconic design objects of the famous designer of the same name, which is responsible for some of the most significant designs of the last century. At Eero Aarnio Originals everything is about Eero Aarnio. His designs, which are timeless and at the same time modern, appear almost like being from another galaxy, and have found a new home at Eero Aarnio Originals. For Eero Aarnio, his home was and is, in addition to his family, the most important thing in life. He always preferred working from home, surrounded by his family and his past designs. For Eero, a source of inspiration has always been and is his wife and children, therefore he never had his own studio. His designs reflect the close connection to his family. That’s why the popular Ball Chair came into being, because Eero wanted to have a seating for his wife, his children and himself together. His daughters - muses, models and product testers from young age one - are still included in the design industry and his wife, Pirkko, is still his closest confidant. 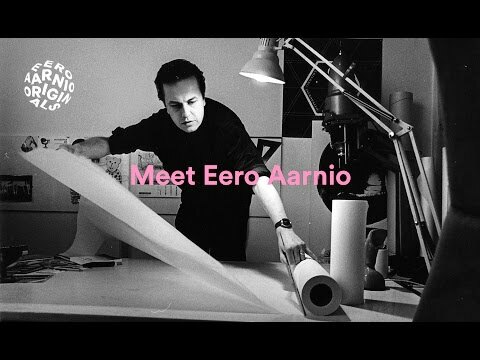 That’s why at Eero Aarnio Originals not everything is just about Eero Aarnio himself, but also about his family, his home and his life. That's the logical consequence, because Eero objects are not just furniture, but feature a very own personality, resulting in a family atmosphere in Eero Aarnio's private home. Designs such as the Ball Chair but also the Tomato or Bubble Chair were absolute innovation back in the 60s and 70s, alone by the materials plastic and fibreglass. Today, his chairs are timeless classics the world of design no longer can do without and won’t do still in the coming century. An Eero Aarnio chair is an investment for life. It is a loyal companion, which one will grow fond of and even the kids will enjoy.